One thing I didn’t try to do (well to be honest I actually completely forgot) was to pay attention to the solution platform chosen to build the project. 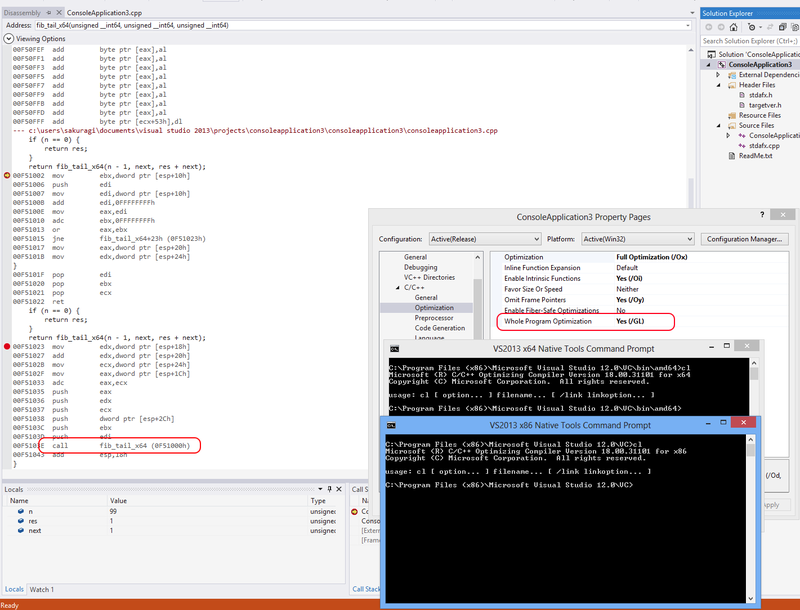 In Visual Studio Win32, which means to compile the solution using x86 processor instructions, is the default configuration set. Looking carefully at the generated assembly in the picture above it can be seen that registers used, EAX, EBX, etc are, accordingly with the configuration chosen, 32-bit processor registers. Surprise!! 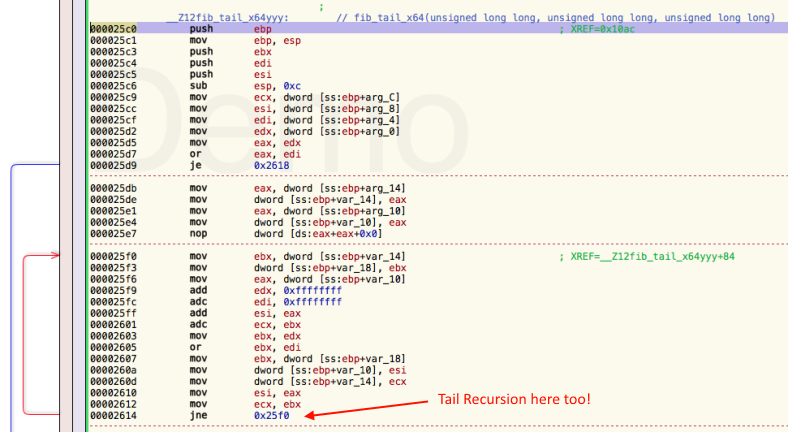 Tail recursion is back, x64 registers are used instead (RAX, RDX, etc.) and the assembly is much shorter and cleaner! 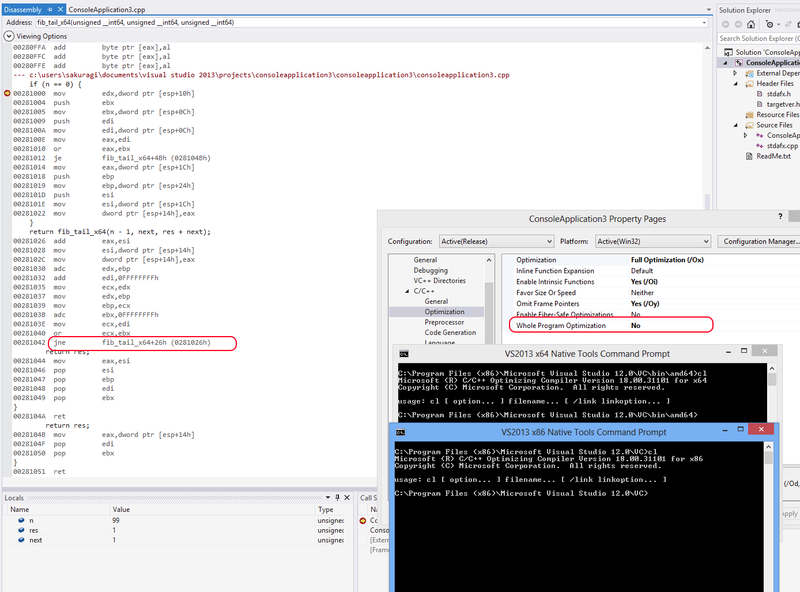 It seems then that the problem is only “restricted” when a x86 platform is targeted and x64 variables used. At this stage I honestly couldn’t really say “it’s definitely a bug in the MS compiler” so still not satisfied I went trying the same experiment using another compiler. This time I decided to change operating system altogether and use Clang, installed on my Macbook as part of XCode and based on LLVM. 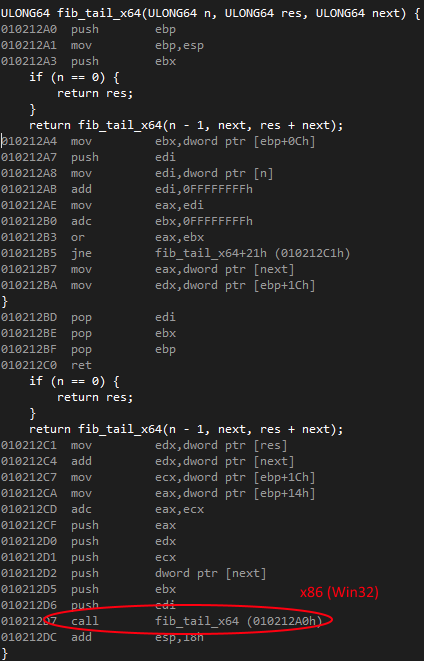 To view the generated assembly I used a handy tool called Hopper Disassembler, available on both OS X and Linux (but for gdb debugger would have sufficed too I guess). Tail Recursion is clearly enabled: JNE (Jump Not Equal) is just a conditional jump when ZF (the “zero” flag) is equal to 0. The red arrow on the left points at the address where the program execution jumps if the condition is true. The careful observer might have already noticed that this code is not compiled for 32-bit processors. The assembly registers are actually 64-bit (RBD, RDI, etc.). Our goal here is to verify instead that targeting a 32-bit platform tail recursion would still be enabled. Bingo!!! 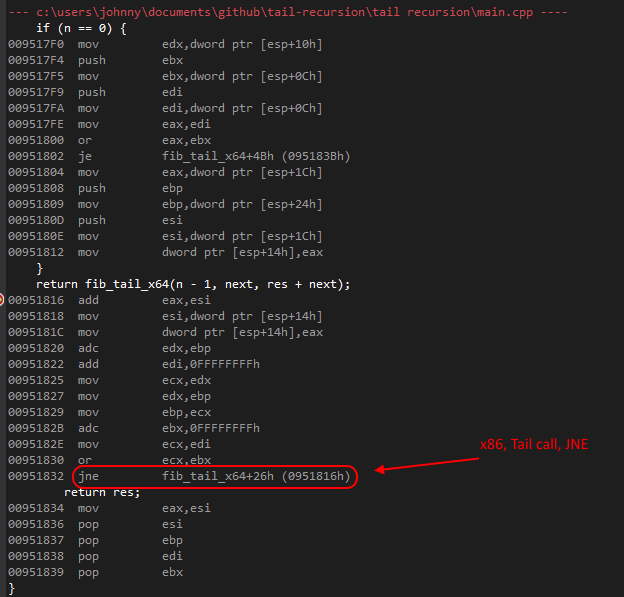 By looking at the type of registers we can state that the executable is targeting the correct architecture we chose, and look at the last instruction the surprisingly result: Tail Recursion is enabled for 32-bit too!!!!! After a few attempts I changed ‘Whole Program Optimization’ from /GL (yes) to No. 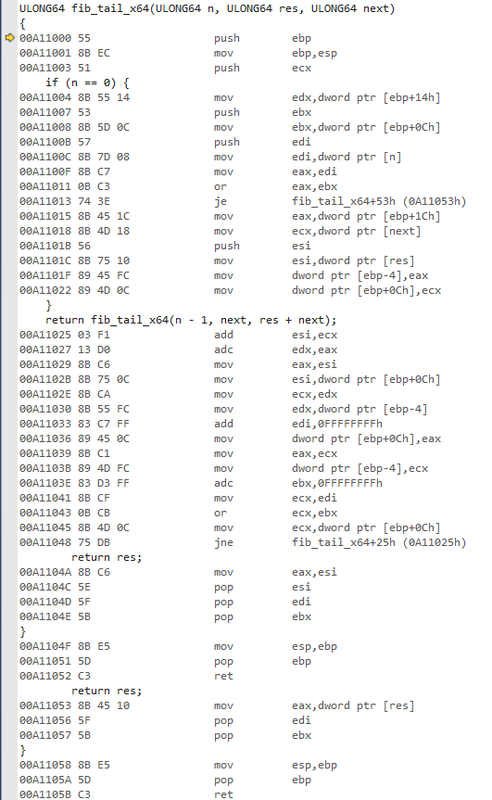 I changed ‘Omit Frame Pointers’ too as I was pointed out that the generated x86 assembly, with frame pointers, is way longer and uglier (and we probably save a few clock cycles avoiding some cache misses too). There is a nice explanation on StackOverflow if you want to read more about omitting frame pointers. So far so good, nothing special there. I’m just passing literals as parameters. 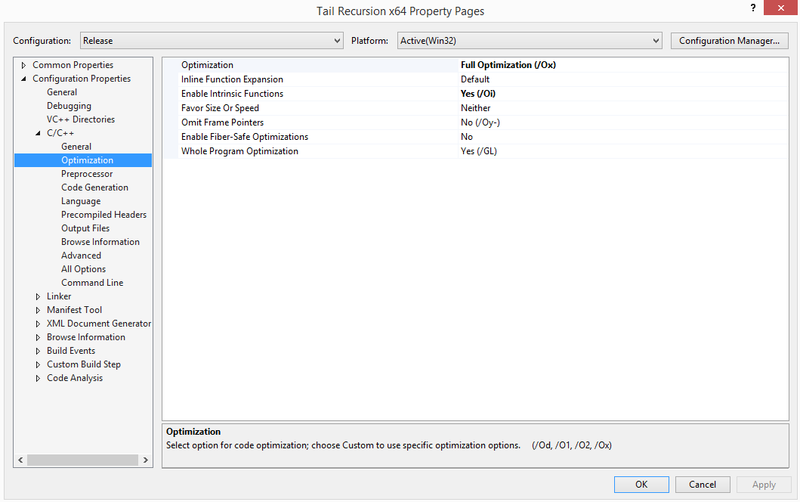 Although I was initially sure that a possible explanation for the absence of tail recursion was the presence of a bug in the Visual C++ compiler it turned out it is not. The assemblies produced by both VC++ and Clang are very similar for x86 platforms. 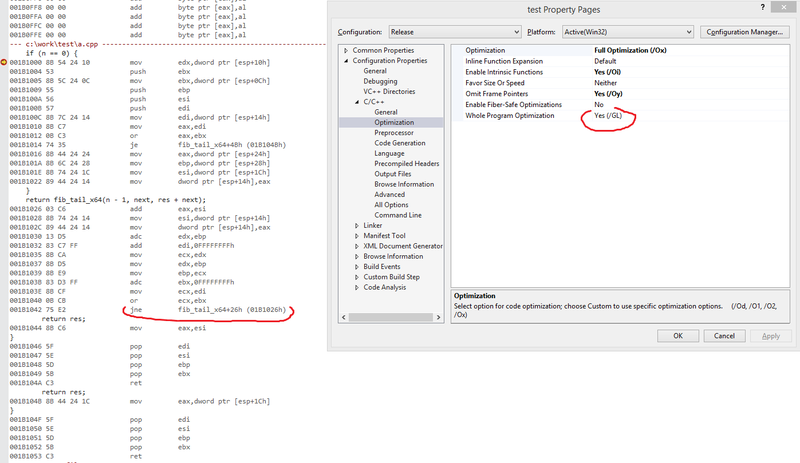 My first conclusion was to keep in mind is to disable ‘Whole Program Optimization’, if and only if you are calling the x64 recursive function directly and passing literals as parameters. After a second analysis it emerged that for a few users this was not happening as they were calling the function directly using variables or indirectly through function pointers. I would be still interested to hear some thoughts from somebody working on the Visual C++ compiler team to know the reason behind this “issue”. That’s all guys, thanks for reading, see you soon! I can not reproduce these results in MSVC 2013 Ultimate Update 1 with optimizations enabled. Only when optimizations are disabled do I get the same results as you. Sorry, I meant to say enabling WPO, not disabling.